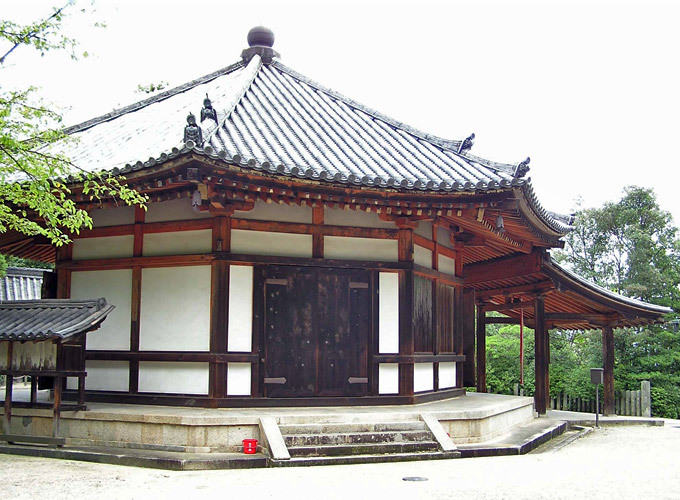 An octagonal hall at Houryuuji 法隆寺, Nara, which was destroyed by a typhoon in 1050. The structure was rebuilt in 1250. It is the second largest octagonal hall in Japan. The podium dates from 718 and is made of foundation stones *soseki 礎石. There is a low extended edge that surrounds the podium on the upper edge of its surface much like the arrangement of the *Yumedono 夢殿 built in 739 in Houryuuji's east precinct. The steps are constructed on the sides. Double windows fill the bays on each side of the main entrance. The walls are covered with white plaster *shikkui 漆喰. The bracket system is very simple: at each corner is a 3-on-1 bracket complex *mitsudo tokyou 三斗斗きょう, and centered between the corners are bearing-block capped struts *kentozuka 間斗束. During the major reconstruction in 1250, the roofs' internal construction was changed so that the roof became higher than the original one. The tiled roof *kawarabuki 瓦葺, has been changed many times and thus no ogre tiles *onigawara 鬼瓦, from the 13c remain. At the peak is a simple tear-drop shaped form *houju 宝珠, made of iron. The inner sanctuary *naijin 内陣, is an octagon formed by eight stout pillars with the same diameter as the exterior ones. A small octagonal dais is centered within this area. A step canopy *kouhai 向拝, with an undulating gable *karahafu 唐破風, was added in the Edo period but was replaced during the repairs of 1935 with a canopy more suited to the 13c design. The main image enshrined is of *Yakushi 薬師. It was saved when the building was destroyed in 1050 and was housed in the Houryuuji *Daikoudou 大講堂 until the rebuilding in 1250. The statue was made by the *dakkatsu kanshitsu 脱活乾漆 method, using the Nara's period's dry lacquer style.